SFW123DTB Combination Fire/Water Safe is rated 4.5 out of 5 by 47. 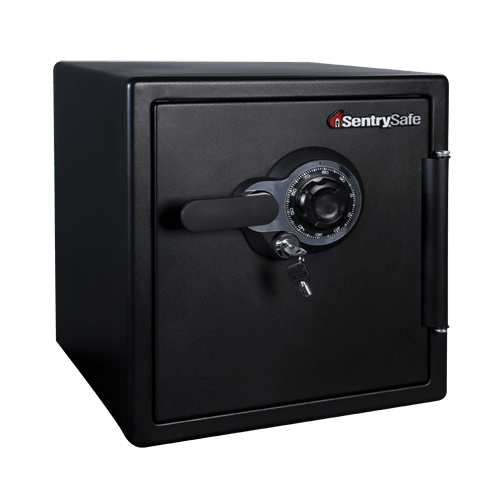 The SentrySafe SFW123DTB offers peace-of-mind for the safe storage of your important documents, digital media and other valuables. With UL Classified fire protection and ETL Verified water protection this safe is ideal for all your home and office security needs. Rated 4 out of 5 by Mark fixed gear from Heavy, but manageable. I mostly like the capacity. X large. Room to grow. Tray is bonus. Door is nice. Dual lock is a nice touch. Electric keypad is a distraction from the real intention of a safe. Security. Batteries? Wires? This is a lure of a "coolness factor" for those who easily take bait. A good combination lock, with key, is the best method. Here's what I wish you would manufacture. Keep the safe looking great by all black. Charge extra $50.00 dollars and make the combination dial, lock mechanism, and handle out of steel. Keep the tray,maybe add one. That would definitely keep me a loyal customer. Thanks for listening. Rated 4 out of 5 by McBob from Solid, strong safe, appears secure This safe is the perfect size for my important documents and other items that need to be securely stored. I reviewed many safes extensively, concerned for both flood protection/water infiltration and fire protection. Ultimately, this was my choice, which should serve my needs. It was easy to set in place (at 100 pounds). I chose not to bolt it to the floor since my home has a monitored alarm system. I was more concerned for water and fire damage. The combination/key set up works flawlessly. Rated 4 out of 5 by PlasticHandlePlasticDial from Dial and Handle are Plastic The safe itself is good. It feels good to think my most important papers won't be destroyed in a fire. However, SentrySafe cut costs by using a plastic handle and dial which feel cheap in the hand. They will melt in a fire. Although, if there is a fire, SentrySafe offers a new safe free of charge so it doesn't make all the difference in the world. I would prefer metal components. 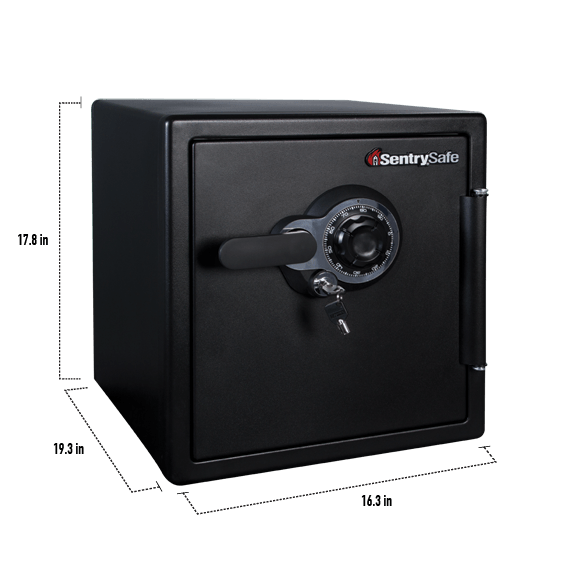 Rated 5 out of 5 by KAT89 from Heavy Duty and Secure I purchased this safe to replace two other smaller secure safes. One of which the latch broke and could not be repaired. That being said, this safe has so much room and holds all my papers from the other two smaller safes and then some. The key lock and combination add extra safety also. Rated 5 out of 5 by Mr Sev teacher from Just the right size I am pleased at the size of my safe. It gives me a lot of space for my valuables and important documents. My only regret is that the digital safe of the same size was $90 cheaper the day after I took my safe home. I would of purchased it at that kind of savings. 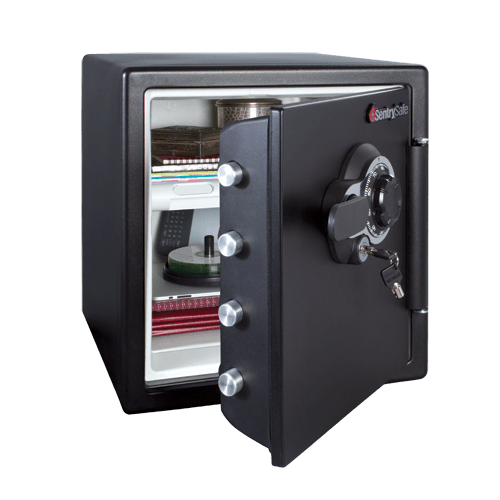 Rated 5 out of 5 by Nbuck123 from Very secure safe We are very happy with all features of this safe. We needed a secure setting for important legal and financial papers that was fire resistant and waterproof. 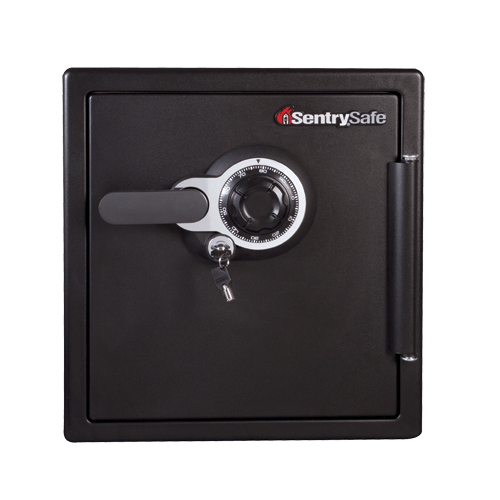 This particular safe from Sentry met all of the specifications that we were looking for. Rated 5 out of 5 by PC Peony from Heavy, secure safe This safe is a good size for most documents. I can fit legal sized in there, also. The try is a nice touch for jewelry, coins, or small items. The combination is easy and the extra key lock is a great deterrent. Rated 5 out of 5 by RMC67 from Strong and secure safe This safe IS the perfect size for all of my needs. I thought bolting it down was going to be a chore but I had no problems, this safe is not going anywhere. I also love the double lock feature via key.